The Cathedral of the Pokrov(St. Basil’s Cathedral) – the Orthodox Church, built on the Red Square in Moscow in 1555-1561. The extraordinarily beautiful, famous temple is a monument of Russian architecture. In the XVI century on the spot where the temple is located, it was a stone Trinity Church, “on the Moat.” The defensive moat stretched along the walls of the Kremlin and Red Square, and was filled only in 1813. Now here it is – Soviet necropolis and mausoleum. In 1552 near the Trinity Church was buried Blessed Basil. From a young age he was endowed with the gift of clairvoyance: he predicted a terrible fire in 1547 that destroyed most of the capital. Ivan the Terrible ordered to bury Basil with great honors at Trinity Church. Soon on this site, construction began of a new Pokrovsky Cathedral, where the relics of Blessed Basil moved. On his tomb began to occur miraculous healings. There are many versions about the construction of the temple. One of them says that Ivan the Terrible ordered the construction of masters Barme and Postnik Yakovlev. Also, there is a legend that after the construction the Terrible ordered blind masters, so that they are no longer able to build anything like that, but it’s no more than a legend, as the document states that after the construction of the Cathedral of the Pokrov of the master Postnik built Kazan Kremlin. St. Basil’s Cathedral consists of nine churches on the same foundation. The central altar of the church is dedicated to celebration Pokrov’s God Mother. On this day the explosion was destroyed fortress walls of the Kazan and the city was taken. The cathedral is built of brick, the central part is crowned with luxury tents, which decorate the dome chapels, the decoration is unique and none of the dome is like another. Notably, the temple is not expressed facade, so which side do not go to the cathedral – it seems that it is the main. 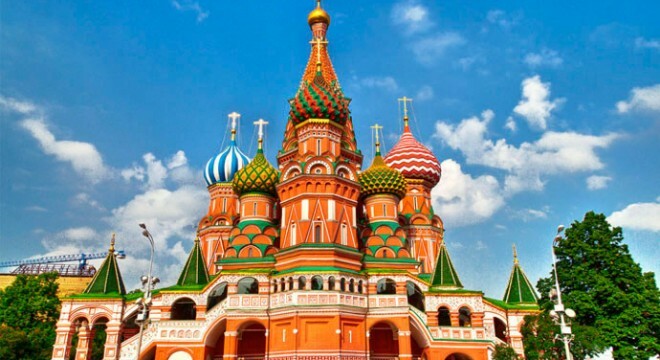 St. Basil’s Cathedral is often subjected to the risk of demolition and rebuilding. So, after the war of 1812, when the French robbed the the temple, O. Beauvais restored, strengthened and adorned iron fence retaining wall of the temple. In the early twentieth century, when Kaganovich represented to Stalin the reconstruction of Red Square for the convenience of holding parades and demonstrations, he removed temple from layout, Stalin ordered him: “Lazarus, put in place!”. Perhaps, that is what sealed the fate a unique monument. Nowadays in the Cathedral of St. Basil is the branch of the State Historical Museum. During a time of great religious holidays in the church conducted services. Now the temple is included in the list of UNESCO World Heritage sites in Russia.